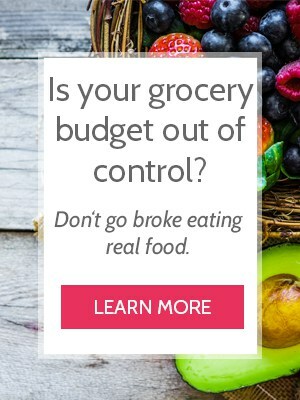 As a busy mom of 6, I know how easy it is for grocery spending to get out of control. 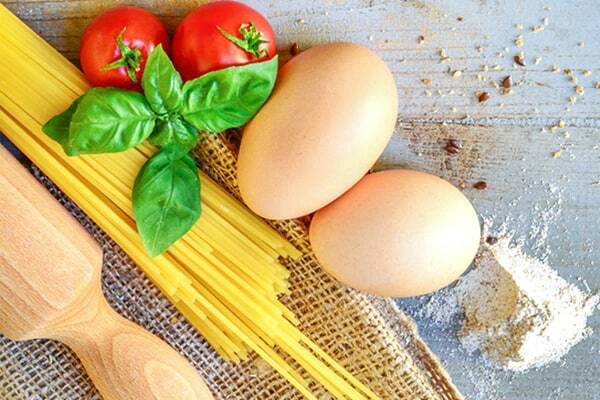 The grocery budget is the largest flexible expense in my home. I can run around the house turning off lights and unplugging appliances, but won’t save nearly as much on electricity for my efforts as I do when I manage my food spending well! Currently our food budget for our family of 8 is $620 a month. This is just food—not cleaning supplies or shampoo. That budget includes $30 worth of ingredients for my husband to make this lunches with (he keeps them at work) and $40 for an emergency eating out trip. 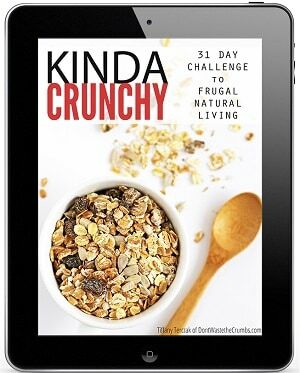 When there are 31 days in the month, we average $2.50 per person per day, or $0.63 a serving. I’ve been helping families reduce food spending for the last 8 years and have found the average family overspends on food so much so that they could buy a cruise ticket every month. Eating a real food diet with plenty of produce is important to me. I just shop for it differently than most. A few months ago I went to a freezer-cooking day with friends. We all had the same recipes, same shopping list and went home with the same amount of food. The others spent between $200-$350, I spent $85. We made multiple meals of Bacon Butternut Squash Casserole, Creamy Spaghetti Squash, Pesto Stuffed Chicken Breasts, homemade meatballs and marinara sauce. One family shopped at a local chain grocery store, another at a Natural Foods store and a third at Costco. I shopped primarily at Aldi supplemented with a few items from my home pantry. One of the recipes called for a block of provolone cheese. Aldi only carried provolone slices, but they were half the price of buying a block of cheese anywhere else. I bought the slices and tore them into pieces instead of grating cheese from a block. My final recipes turned out just as delicious as the others! Remember – I eat REAL food. Before buying anything prepared, I made sure there weren’t any preservatives or questionable ingredients listed on the labels. We put our grocery money in an envelope and when the money is gone, I’m done for the month. 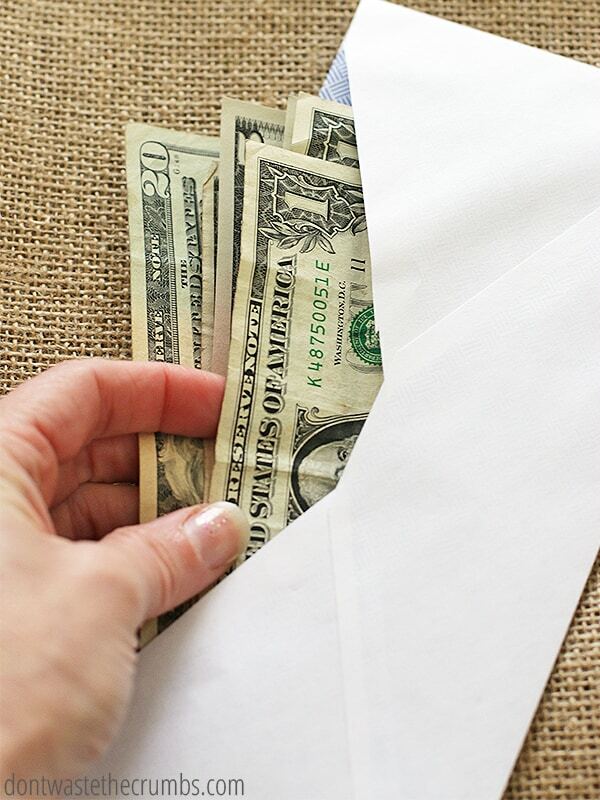 But here’s an insider tip – I like to save a bit in a separate envelope for the last week of the month. Just to make sure we can still buy milk and eggs! 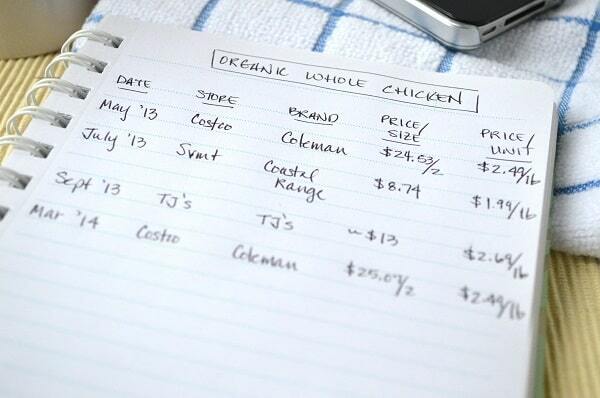 I have a head for numbers and pay attention to food prices. If I didn’t, I’d write them down in a pocket notebook (also known as making a price book). Then when prices drop significantly I recognize the deal. (3) Stock up when the prices are at their lowest. When I see that good deal, I buy enough so that I won’t have to buy until the next sale. (4) Meal plan with the food I already have on hand. I call it reverse meal planning and instead of shopping from a list of recipes, I shop for the best deals I can find and then meal plan around those foods. (5) Buy necessities first, rare treats after. Everyone likes a treat now and then, but it’s easy to spend too much on cookies, chips and soda and not have enough money for healthy foods. I buy the essential foods first. Then – and only then – a treat or two is okay. Once we get used to thinking about grocery shopping in a new way, it becomes second nature to spend less without sacrificing nutrition. 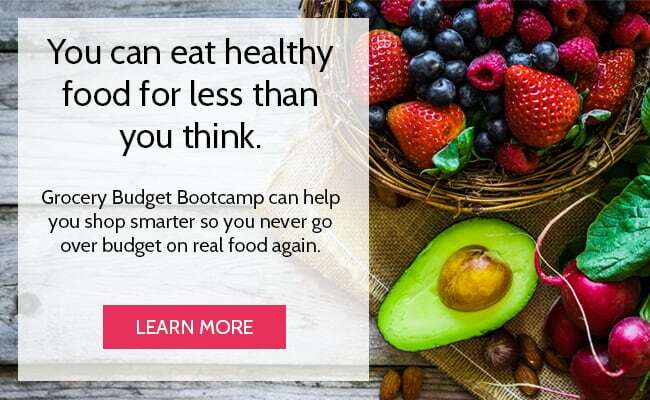 If you’d like to find out more, I’m hosting a whole month of learning to reduce food costs. I’d love for you to join me! 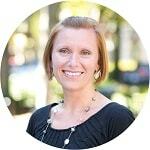 We all have “secrets” to keeping our budgets low- what are yours? This post was written by Angela at Grocery Shrink. Great tips! This month we have FINALLY gone all cash for groceries. Bacon butternut squash casserole sounds delicious! Is there a recipe? Angela and Tiffany, you are two of my favorite food/budget bloggers. Love these tips. I know you can both cook amazing things with very little, because I used the Grocery Shrink book years ago and used DWTC meal plans last year, and my family ate like royalty while not spending much. I admire you both, and appreciate when you share your stories and recipes with us! What great timing for this post! My husband and I decided we needed to get serious (again) about our budget and pay off debt (again!). Apparently it takes us a couple of times to get something to stick. 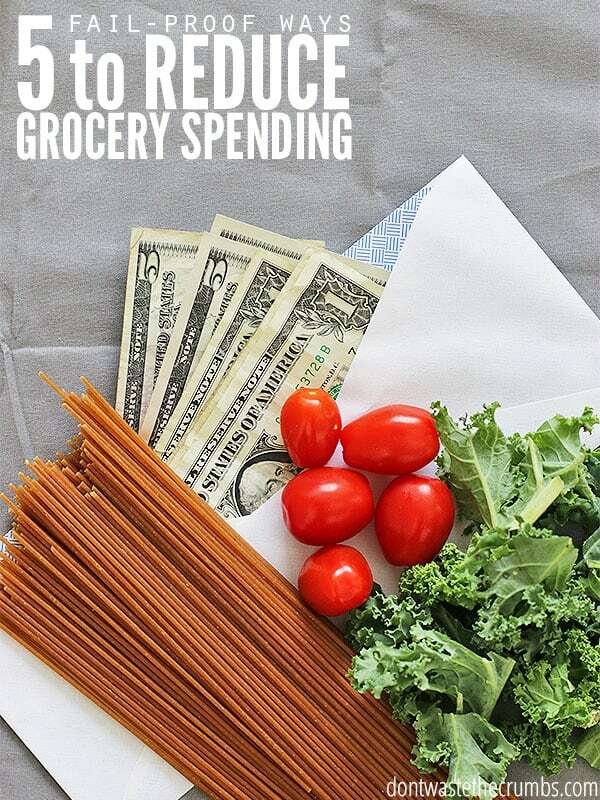 The one budget item that I have absolute control over is the grocery budget. All the other bills, I can only control so much. But food is MY domain. We have 5 in our family (2 adults and 3 kids ages 13, 11,and 5) with one on the way and I have slashed our budget in half to $600/month (or $150 per week). We are gluten and dairy free due to food sensitivities so sometimes I have to decide what goes in the cart and what doesn’t in order to make the budget work. So far, so good, but it’s only been a couple of months. I actually aim for $100/week and keep any reserve for unexpected expenses. Some weeks are more successful than others. Right now I am saving my reserve to pay for our CSA which will start in May (but is paid in April). Then the money that I don’t spend during the summer will be set aside to go towards a share in beef or pork. I love that I am feeling less stressed about our finances. Yes, we have a long way to go, but really, with a little effort, and a lot of discipline, the results show themselves rather quickly. Thank you for all the inspiration and motivation! I would love more tips on how you keep your budget so low. We are also a family of six (ages 41, 39, 19, 11, 9 and 3) and currently spend about $400 per week! We try and try and try to get it lower but always end up higher. We eat organic and have two with celiac (so gluten free as well). I am open to tips and suggestions-I know we can do better! I would say the first thing that went was snack foods. We have been a real foods family for sometime, but I can honestly say that when I am not keeping to my budget, I spend more, and it’s usually on convenience foods . I also stick to cash. It’s harder for me to part with cash than it is to swipe my debit card. We don’t spend a lot of money on gluten free items. I usually will make them or we go without. I do set aside money each week for a really good brand of bread that I can get locally when they have their bi-monthly sale. I am trying to spend about a quarter of my budget on meat/non-dairy/eggs, a quarter on miscellaneous items, and 1/2 on produce (organic when I can but more emphasis on local and seasonal). Taking a cue from Tiffany, my family is learning to adjust to fruits and veggies for snacks or foods I make. We have chickens and now that the days are getting longer, my need for buying eggs is going down but I only spend $5/week on eggs if I have to buy them. My older two can do some cooking and so I try have them take care of their own breakfast and lunch. I have been really tired with this pregnancy so it has been a blessing that they were already quite capable in the kitchen. Now I will admit, our eating isn’t perfect. I am currently buying a box of cereal per week (it has to last them a week because once it’s gone, that’s it) and that is because of the pregnancy. But once I either gain some energy or have the baby, it’s bye-bye cereal! I try to buy good grass-fed meat at the farmer’s market but still buy conventional because I have to. I hope to have saved enough to buy a meat share by fall. I just bought two 8 pound pork roasts for the price of one and was able to portion it out to make 6 meals! I also do a lot of freezer meals and keeping my budget low each week depends on our eating out of our freezer. I guess those are my main things that I can think of. It takes effort and planning, but it is possible. Big families are a blessing and it has been fun teaching our kids about budgeting and meal planning. Good luck with getting your budget down. Tiffany has a lot o great ideas and my biggest tip would be to switch to cash. You will be amazed. Good luck and God bless. 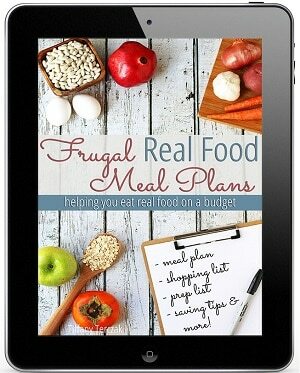 I agree with Chelsea that I’d love some of your tips about keeping the grocery budget low. We have 5-6 people we feed (the kids are mostly adults but still living at home, so they sometimes eat elsewhere), and I’ve been averaging $300 a week. We’re eating better, but it’s clear I have a ways to go in learning how to eat healthy on a budget! I just responded to Chelsea above. My biggest tip is go to cash only and scour Tiffany’s site. She has so many great ideas and recipes. We love her tomato soup recipe. I can get 4 meals out of that one! Thanks for this article!! I’m totally going to implement some ideas… well, ALL the ideas haha. I make bread from scratch, and cookies/muffins etc from scratch to keep the costs down. That way I can still give my kids treats and not sacrifice my budget. Hi, would you be able to share the recipes for the freezer meals? Bacon butternut casserole sounds amazing! You can save on produce by growing your own fresh herbs in pots in the windowsill, and no matter how little your backyard is there’s always space for couple of tomato, cucumber, or zucchini plants! Preserve whatever vegetables you don’t eat by canning them for the winter. I. know the regular prices for staples such as sugar and flour. When I see four pounds of sugar on sale at Kroger for $1.99, I skip it knowing whenever I am running low, I can get that 4# sugar at Aldi for $1.49. Same goes for flour, commonly used spices, coffee, bagged salad greens etc. I review the E-coupons or each store i.e Kroger and Meijer and compare the prices in the weekly sale ads from each store. An example: this week Kroger has a 16 oz jar of Kroger peanut butter on sale for 88 cents. E-coupon on line for 75 cents off if you buy two. Basically, I paid 13 cents for the second jar. Unopend jars last quite a long time before the oils would go rancid. Kroger also has Free Friday. If it is something I won’t use, I asked the kids if they want it and if not, place it in the food basket at church for the food pantry. Checking sale ads and comparing them and clipping the matching E-coupons on line can save a lot of money. Today, between the sale products, E-coupons and Free Friday at Kroger, I spent $22.07, and saved $31.07. this included 1# of sausage links and 9#s of Honeysuckle Turkey Breast to bake. I also use Meijers MPerks and check the rewards section to see what they are offering. I don’t click on the rewards I want to try and meet quotas on until the day I am going shopping as they give you so many days to spend a certain amount of money in order to get the reward. Generally, something like: $3.00 reward on next shopping trip if you spend $25.00 on fresh fruits or vegetables in 30 days. If prices are about the same at several stores and I am close to getting a reward, I will buy at Meijer instead of somewhere else. Spending $200. in a month at Meijer will get you a $7.00 reward. Unless you have a large truck or RV with a huge gas tank, the savings are more by taking the Meijer cash on your next shopping trip. It really pays to coordinate these offers. I would like to mention one thing about ALDIs I find most of the food has alot of preservatives and stuff I don’t want in my body. The only thing I buy is the vegs and fruit but other than that I dont think it is very healthy for you. Aldi has a jar of tomato sauce with no sugar and no preservatives and at a great price. You just have to read the labels. Hi Suz – in short, there’s a careful balance between the two. The key is to be strategic with your list making and shopping, every time, so that when instances like this happen, you have enough money for all of the above. 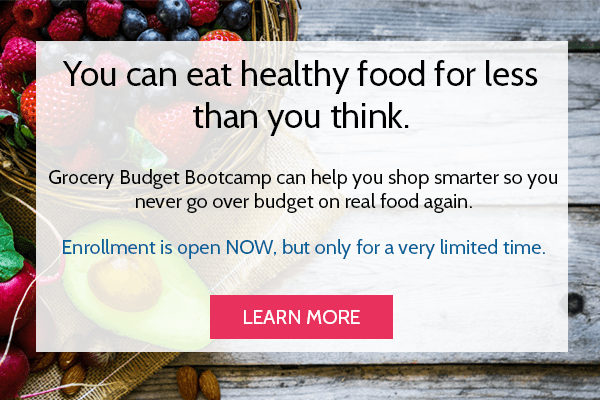 I actually teach this exact concept in my class, http://grocerybudgetbootcamp.com!